Facebook seems to be feelings its biological clock ticking, as today it launches a new Timeline event that lets you share that you’re expecting a baby, the due date, and whether it’s a boy or girl. Baby announcements appear in the Celebrations home page sidebar beside birthdays on the day the kid is expected to pop out, along with showing up in the news feed. Facebook tells me it’s exploring whether the feature will power an existing advertising option to target “expecting parents” that could be very lucrative. This new life event for expecting a baby also opens up a new advertising is another sign that Facebook is maturing as its original user base of college kids from 2004 start hatching little ones who can join Facebook 13 years from now. 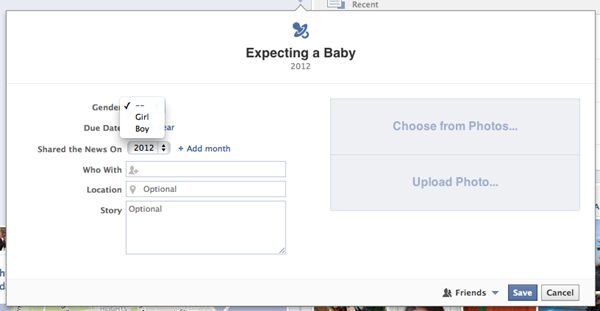 The feature replaces a more confusing option to add an “Expected: Child” to your list of family members. You can add a baby life event by selecting the announcement from the Life Events drop down in the publisher on your Timeline. 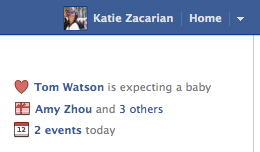 Facebook doesn’t discriminate about who can say they’re expecting. Single, in a civil union, or otherwise, you can still say a kid is on the way. You can add additional info like who the other parent is, location (is that conceived or where it will be born? ), and a longer story. You can set a future publishing date if you want to wait until the bump starts to show. Also, you can add a photo to the story, which might encourage more ultrasounds to end up on Facebook. That Unbaby.me extension for removing photos infants from your feed is about to get a lot more useful if it can detect fetuses too. Once published, the story will appear in the news feed immediately, and grace the Celebration sidebars of friends’ home pages on the due date. Facebook has offered an “expecting parents” ad targeting option for about six months but it was essentially guessing based on what Pages you Liked and other options. 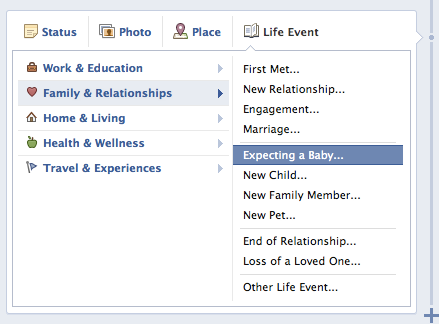 Today’s feature release follows the added ability to announce the date of your upcoming marriage on Facebook. And who knows, maybe the push is Zuck’s subtle way of saying him and his new bride are expecting. Just kidding. This is about making Facebook a host for the most important moments in your life, and maybe making some money off those moments down the line.